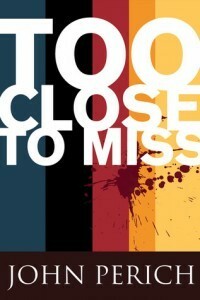 Have you heard of John Perich's fiction book titled, Too Close to Miss? If not, I'd encourage you to pick up a copy. In this thriller, action, suspense title, Perich touches on the subject of infidelity and the ramifications which never really go away, even after an affair has become a thing of the past. This was the situation Mara Cunningham and Daniel Hadley were in. They had fallen into an affair despite Daniel's wife and son waiting for him at home and, later, mutually decided to call it quits. Even so, Mara would re-enter his life after hearing someone had tried to kill him. She would soon learn that his wife and son had been killed. As discomforting as the situation was, it seemed worse when realizing the brutal attack had gone down when the family was where they felt the safest - in their own home. Mara didn't re-enter Daniel's life as a lover this time; she entered as the investigative reporter she was trained to be, determined to find who pulled the trigger. When Daniel went missing, the stakes escalated and Mara spent every waking minute trying to track down leads, which often landed her in perilous situations. There's a lot of flashback in the story. We're told what's happening in the present, and then learning about what happened in the past - comparable to reading two stories at the same time. However, if not for the flashbacks, Daniel Hadley could never have been a main character since we only saw and heard him a couple of times. The flashbacks brought his character to life - the man he used to be and the man he had become. I'd like to think that, at the time of his wife's and son's death, he was the perfect father and husband. His priorities seemed to have straightened out and his sense of duty to do the right thing, in various situations, seemed paramount. But casting Mara Cunningham and Daniel Hadley aside, there are many richly defined characters in Too Close to Miss, from "clean" criminals to dirty "supposed" officials. Ironic? Perhaps, but it goes to show that we don't know all the facets of the people we encounter on a daily basis - and there is good in everyone, regardless of their stations in life. I noticed afterwards that Too Close to Miss is part of a series and I can't wait to read the remaining titles of the Mara Cunningham Series as they become available. If you'd like to learn more about Too Close to Miss and/or read the numerous ratings, please click the book cover which will take you to the book's page on Amazon.